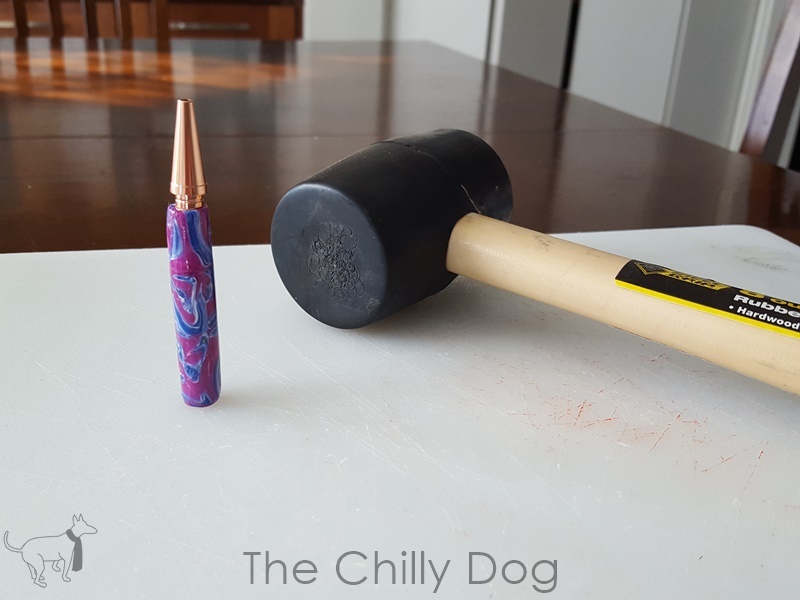 In the crafting world, things don't always go as planned. 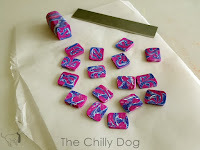 Last week I showed you how to make a couple of quilt block inspired polymer clay canes. My intention was to use one of those canes in this pen tutorial, and then I had a craft fail. I tried to reduce the cane too quickly and the quilt block turned into a quilt blob. 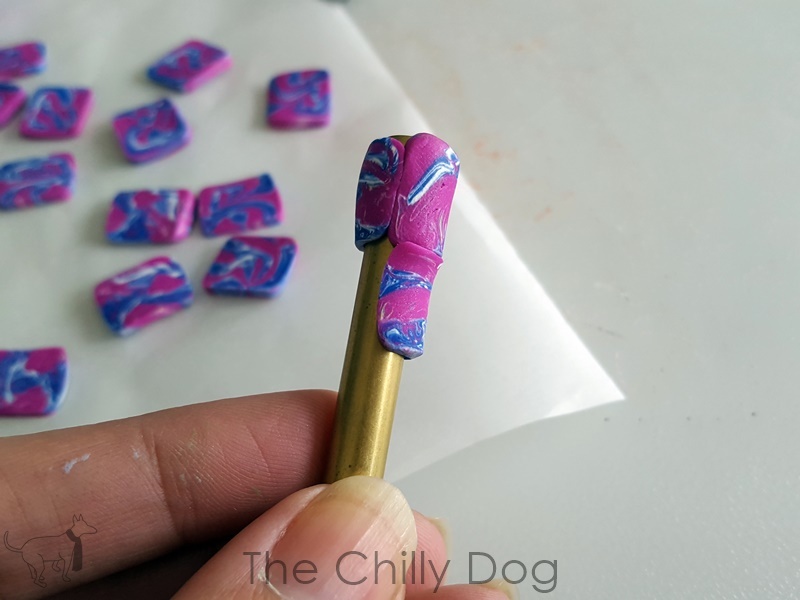 As I was smooshing up the leftovers of my mistake learning experience, I realized that in my frustration I was making a lovely piece of marbelized clay. What a happy mistake! 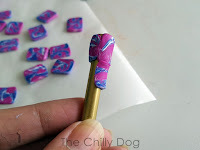 We'll call this marbled clay pen tutorial Plan B, but I think you are going to love it. Make sure to protect your work surface. Sometimes the colors can stain. I like to use a piece of parchment paper if I am working at the table. I also have a cutting board dedicated to clay crafting. 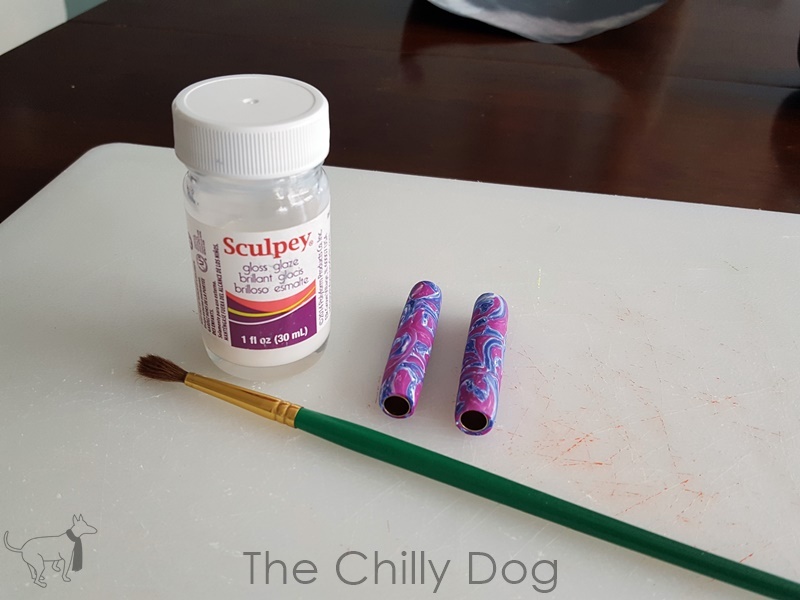 Squish, swirl and smoosh 2-3 colors of clay until you get a nice marbelized piece. Shape the clay into a square cane that's about 3/8 of an inch in on each side and at least 2 inches long. 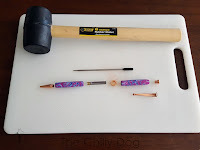 Use a cutting blade to cut the cane into thin slices (about 1/16 of an inch or less). For the best results, make sure your slices are an even thickness. Cover each brass tube from the pen kit with the clay slices. At this point, it's okay if there are small gaps between the slices. 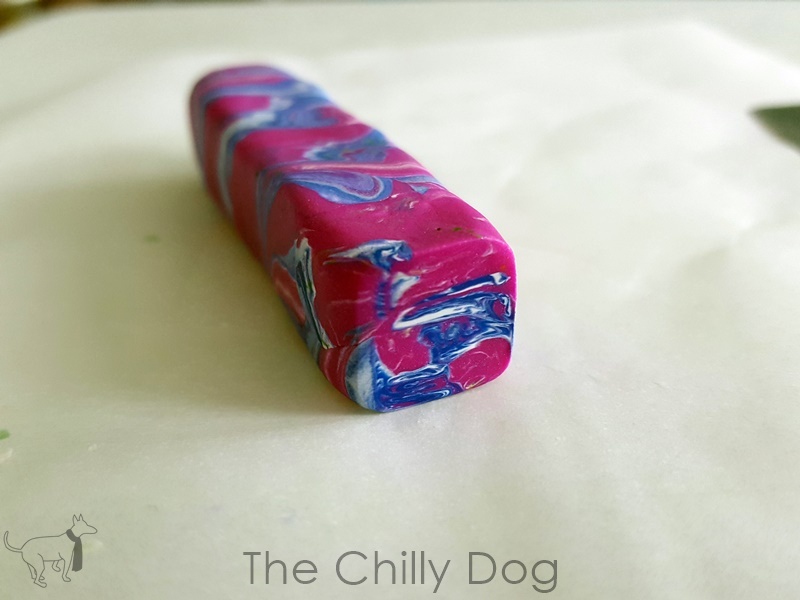 Gently roll and press the clay to fill the gaps, conceal the joins and make sure that the clay has the same thickness all the way around. Use a blade to trim the clay at the ends of each tube. 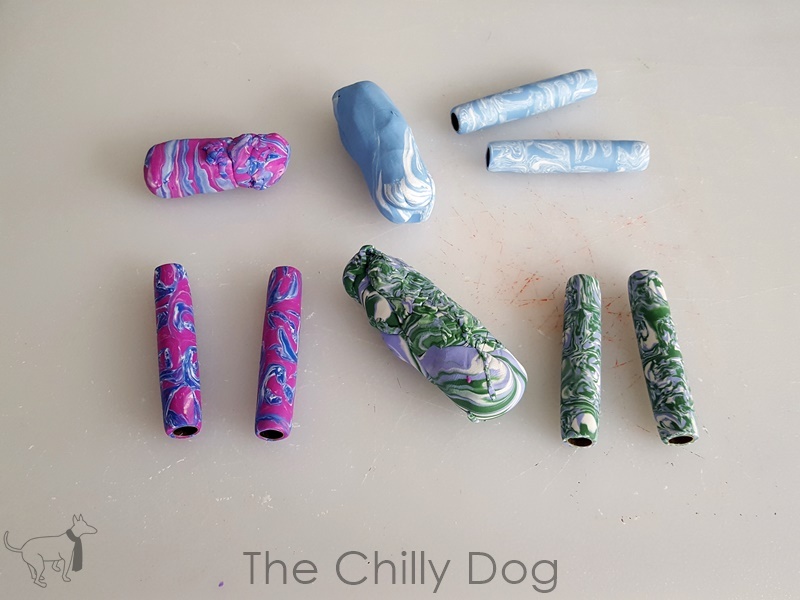 Once the tubes are completely covered with clay, they can be baked according to the manufacturer's instructions. After the pieces come out of the oven and cool completely, you can use a piece of sandpaper to buff out any imperfections or irregularities if necessary. I wanted a glossy finish for my pens, so I added a couple coats of glaze to each tube. 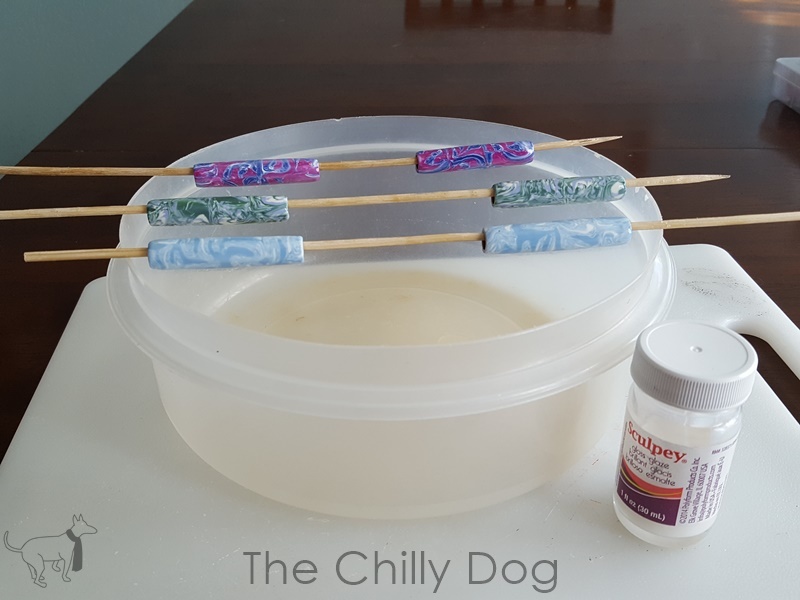 When applying the glaze, I like to run a skewer through the pen tubes and balance them on something like a plastic container so I can coat the pieces evenly and avoid smudging them with my fingers. 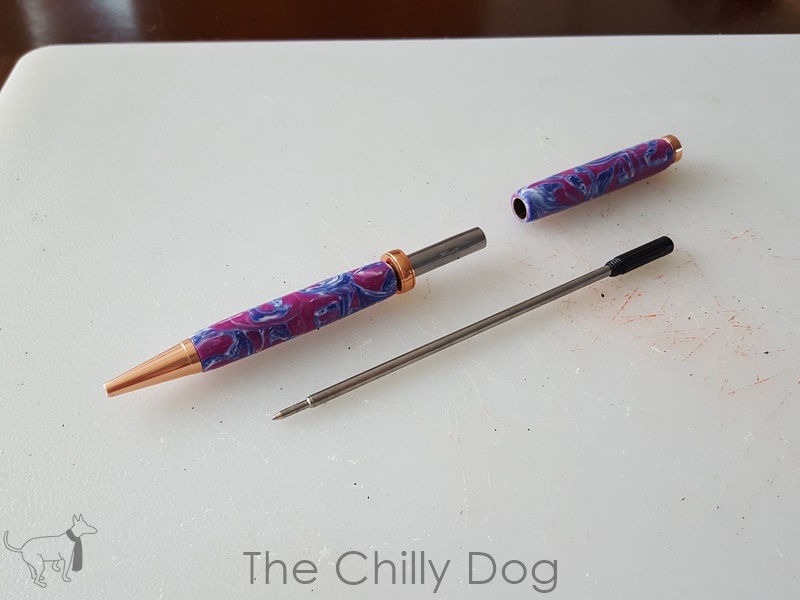 Once the glaze has dried completely, It's time to assemble the pen. 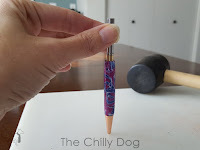 If you plan to make a lot of pens, it would probably be wise to invest in a pen press. 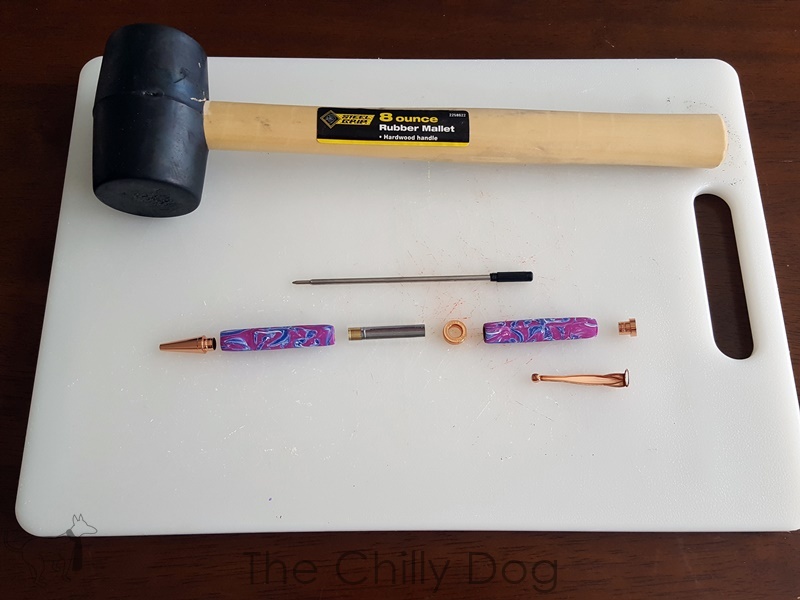 However, you can get good results by using a rubber mallet instead. The tip of the pen goes into the end of one of the tubes. Again, make sure to protect your work surface. I am using my (non food) cutting board to avoid dents in the table as I tap the pen pieces together. 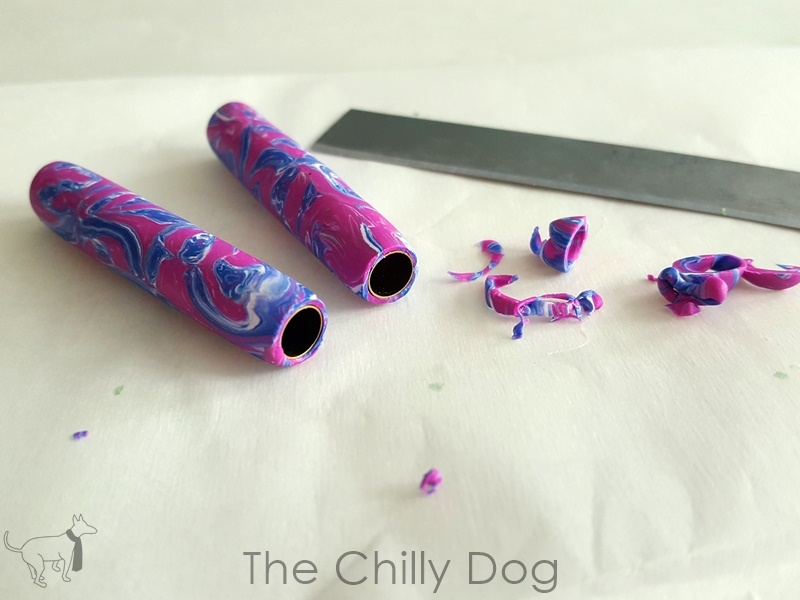 Next, the twist mechanism gets tapped into the other end of the tube. 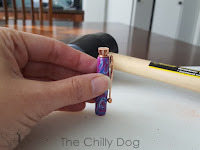 Finally, the end cap and clip get tapped into one end of the other tube. Now that the hammering is done, slide on the center band then insert and twist the ink cartridge into the twisting mechanism, and slide on the pen top. 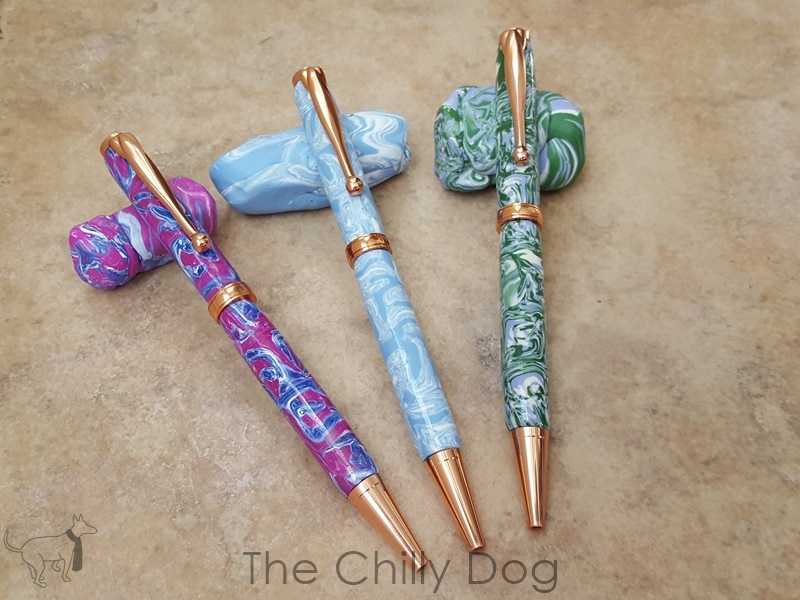 Of course, you could use a decorative polymer clay cane to make a twist pen in much the same way. But if something goes awry and you have a craft fail, don't be afraid to embrace your mistakes and use up your scraps to make something more random and beautiful. 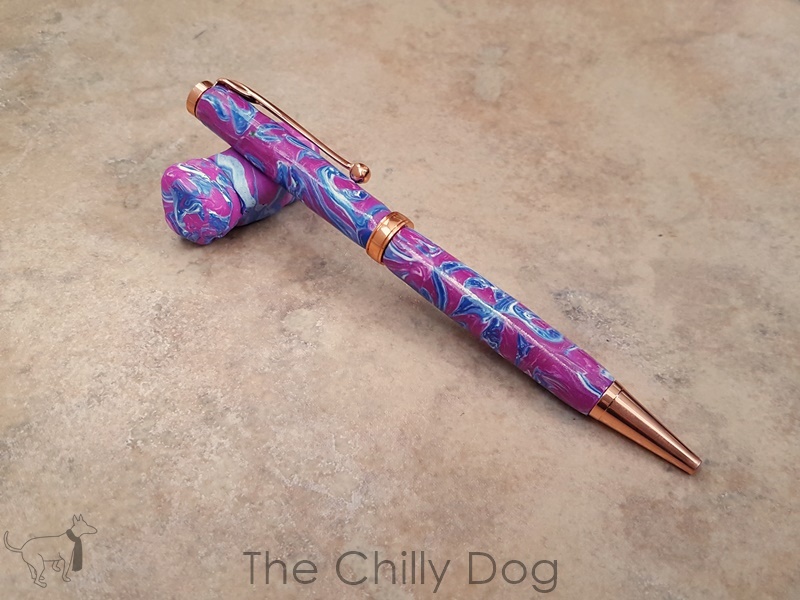 Learn how to use a marbled, polymer clay cane to make a beautiful twist pen.